The truth is more like this : - “It’s going spectacularly well, and also spectacularly badly”. Life on the cliff edge, that’s me, living life at the height of the cliff, but always with my feet dangling over the edge. It’s been a year now since I raced the Out of the Blue event at Ashburnham Place that kicked this whole ‘running from suicide’ thing into action, and since then, things have exploded beyond my wildest imaginings. · I’ve run faster than ever before, setting a personal best at the London Marathon in 3h17. · I’ve also run further than ever before, running my first ultra event yesterday and coming 9th overall out of 151 at the Weald Challenge 50k. Incredible race, and by far the most beautiful to date. · I’ve been coached by Liz Yelling, double Olympian marathon runner when she came down to Bexhill with Body Shock Fitness to take a Saturday morning session. · I’ve joined a couple of runners for their very first 5k race, cheering them on as best as I could, and may I just say, those girls can sprint – way to finish strong! · I’ve spend 5 hours up on Beachy Head with the Beachy Head Chaplaincy Team (BHCT), observing a shift as the team live their lives on the literal cliff edge, talking and loving people back from the edge. For me, the cliff edge is quite literally ‘holy ground’. It’s terrifying and overwhelming in ways I can’t possibly express here. And yet, there is no place I’d rather be. I visit the white cliffs of Beachy Head almost every week now, and it is without doubt now my favourite place in the world. I can see it from the end of my road too. The cliff edge. It’s where I belong. It’s where life meets death, and it’s where I want to be so that I can pray, run, whatever it takes…. The day I went up with the BHCT for the first time, someone sent me this. 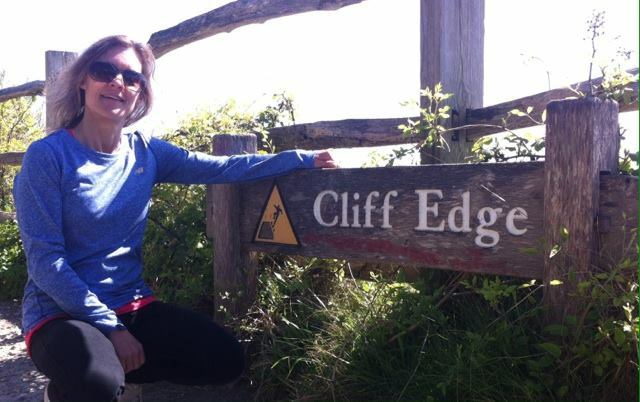 This person didn’t know anything about my visit to the Cliff Edge, making it all the more poignant that she sent it that Friday.